A commission for FirstSite Gallery (collaboration with Stuart Bowditch) documenting their '15 Artists, 15 Days' programme, a project that celebrated firstsite’s 15th birthday. 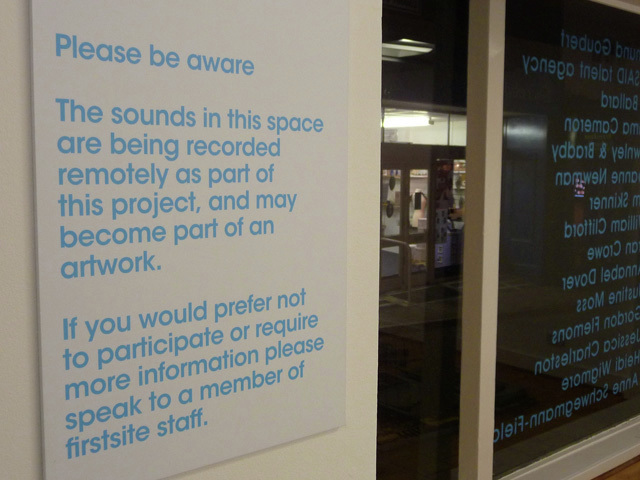 'Automatic Listening' involves placing ourselves at a distance from the recording location, streaming sounds via a hacked VOiP connection, aiming to make sense of the disconnection of place and outcome. By setting up the computer to start automatically and work remotely, we could remove ourselves from the space. Listening in through a (hacked) Skype connection we put ourselves in the position of our audience from previous projects, interpreting what we heard and felt to try to make sense of what was going on. 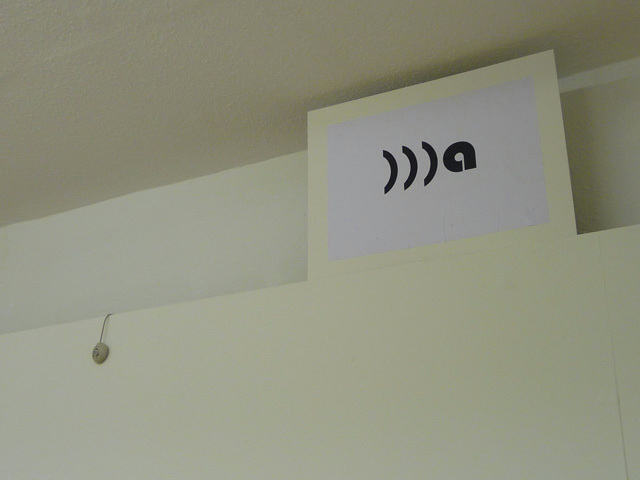 The quality of the internet connection fluctuated; some streams became full of interference whilst others were clear, and we could make out whole conversations and identify activities from within the gallery space. We remotely recorded 1 hour segments of each of the fifteen one-day residencies over the internet via a microphone and 'headless' computer. 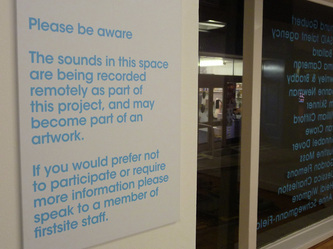 More than 15 hours of recorded footage were distilled down into a finished soundpiece for publication on the Firstsite website. The final piece, 15 minutes in duration, was created by layering, repeating and editing the collected sounds to produce a soundtrack that captures multiple aspects of the residencies - not just the artistic outcomes, but the processes, the interactions, the preparing and making. ...is a series of 15 artist residencies, each lasting a single day. The participating artists will swap a day in their studio to make new work, test ideas and experiment with their practice in a semi-public space. Residencies will take place consecutively as a cumulative process, with a showcase event at the end to display a range of outcomes. 15 Artists, 15 Days will feature new media and live works, responses to the site and situation, installations, participatory events as well as painting, drawing and making. 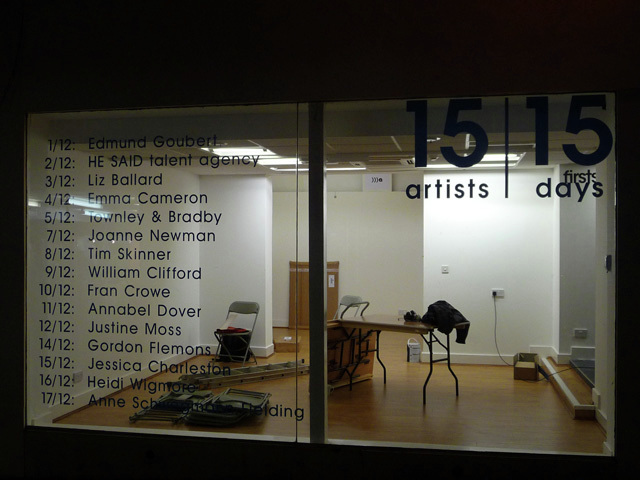 15 Artists, 15 Days will take place in FirstSite's new premises: 4-6 Short Wyre Street, Colchester, Tuesday 1 - Thursday 17 December 2009 (everyday except Sundays). The space will be open 9.30 - 5.00 Monday - Saturday.